One day, you find yourself on the wrong side of the car. And your rightful place, the seat behind the wheel, is occupied by your eager teen. Not only that, you have just voluntarily given her the car keys. Rules on teenage driving vary from state to state, but not matter how the law handles that transition, even after twenty lessons with a driving school, and even after having passed the road test, you still end up with one green driver at the wheel. Your wheel. Take a deep breath. Your parents did this for you: you can pass on the gift to your kids. Unless you're lucky, and have one of a growing number of kids who are much more interested in hogging your WiFi bandwidth than hogging your car. So here are a few tips on how to coach your teen into becoming a safe driver despite their lack of experience. Even in your own car, without the dual brake and gas pedals installed in driving school cars. If you go about it the right way, they might even still talk to you afterwards (even if it's only to ask for the car keys). The name of the game, as with teaching anything to kids, is to broadcast your expectations. You know, as in, you expect them to clear their own plates after dinner. And of course they will vacuum clean their room once a week. Very succesful parents get their kids to vacuum clean their parents' bedroom too, but I'm not one of those parents. Teens are fast. Their reaction time is short - anyway, a lot shorter than their parents'. So our job as a driving coach is to teach them to work, not with their personal reaction time, but that of the car. For instance, it may take 0.2 seconds for your foot to hit that brake, but the car takes several seconds (and many feet) to actually come to a stop. If you have a chance, find a deserted stretch of road. Choose a mark, like a pole or a fire hydrant. 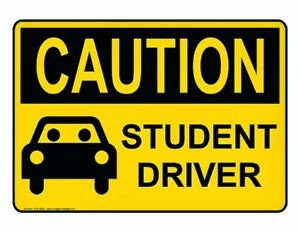 Get your teen to drive at some speed, then when you're at the mark, tell them to brake hard. Do that at 10mph, 25mph, and (if the road allows) 40mph. Note how the distance to come to a stop increases with speed. This exercise really brings home the importance of moderate speeds for safety, and reinforces the three second rule that says your way should be clear for three seconds' worth of travel ahead of you. Every teen goes through corners too fast. My dad always told me that the thing to do is to slow down before you get to the corner in such a way that you accelerate as you go around that corner. It's a good rule of thumb: it means you've slowed down enough to take that corner safely. (Should your teen go into a turn with a speed that obviously too high, you can use the hand brake - but gently). I got her back for that, though: on another day our route took us over a very narrow metal bridge, the kind where the road surface is a metal grating through which you can see the surface of the water. This is an older bridge and its two lanes were, shall we say, not wide. Mercifully there was nobody else on the bridge when we reached it. But just as she had got used to keeping the car far enough away from the guardrail, a fat SUV appeared on the far end of the bridge. A moving SUV is apparently scarier than a stationary guardrail, so there was a moment of panic, but I made her slow down to a crawl, which allows you to get much closer to that guardrail - and puts the responsibility of passing without a scratch on the guy who is moving faster. After that experience my daughter hasn't had a problem approaching a narrow section like a bridge or a section of road with parked cars on the side. She simply slows down. When it comes to parking, low speed is all about being able to correct for any mistakes. Encourage your teen to inch in and out of parking spots, all the while looking around all 360 degrees. Especially when backing out of a parking space it's essential that they learn to look out for pedestrians behind them as well as other cars - and pull out of the space without running into the neighbouring car. This may sound counter-intuitive, but it is actually easier to back into a parking spot than to go in forward. The reason is that all you have to do is position the rear wheels in the right place in front of the parking spot; after that it's easy to straighten out and push the rest of the car into the spot. The narrower the parking spot, the better off you are backing into it. Bonus: when you're ready to leave, it's much safer to pull out going forwards than backwards. That last bit is particularly true if the parking spot you're pulling out of happens to be your driveway. Backing out onto the street is the cause of too many accidents; so our car is always backed into the driveway. Driving instructors have different tricks to help you get into the space, but some of them depend very much on the kind of car you drive. However, once you learn to back into a parking space, parallel parking becomes much easier! It is also basically a matter of positioning your rear wheels correctly, and then using the front wheels to ease the car into the space. But no matter what theory you have in your head, in the end mastering parallel parking comes down to a lot of practice. Driving instructors have an orange cone with a flag; I hauled out our plastic trash can and our organic waste can, stuck a cut of bamboo for a flag in each and placed them where the corners of the next cars would be. I started them spaced nearly two car lengths apart, and gradually moved them closer together. It makes a difference if you take the time to drive around the block so you approach the "parking space" the way you would under real circumstances. On these occasions my teen always did better with the parking than when she pulled out, and then backed in immediately for the next try. 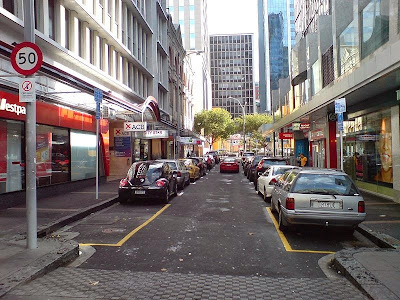 Occasionally, we would turn the car around (practising a K turn) and take a shot at parallel parking on the left side. It is sometimes frustrating. One day we had to quit after about three tries: it was just not going to work out. And that's okay. Remember that my daughter had to pay attention to the standard transmission, on top of the demands of the parallel parking itself. Being in the right frame of mind is important when you're just starting out. A huge part of driver safety is anticipating what can go wrong. Or as my dad used to say, "Driving is easy. It's dealing with all the idiots on the road that's the tricky part." Steering in itself is not always easy. Working the gear box and the clutch without stalling takes a lot of attention as well. And yet it is crucial that they also pay attention to the parts of the road that aren't ostensibly and immediately important. So I remind my teen often to look in the mirrors, so stay aware of what's going on beside and behind the car, and to be aware of the blind spots that any car has. It gets easier with experience, but you might as well start them out the right way. There are times it seems a teen's attention span is hardly longer than a toddler's. But driving is one of those things that requires your undivided attention for as long as you're moving. So I have nixed the use of the radio and the USB port in our car, except for long drives on the highway. Of course, texting while driving is absolutely out - and we've worked on that for years, starting way before the first driving lesson. Then there's the talk about how it's really okay to ignore the friend who's riding with you because your driving has first priority. Newer cars have a bunch of options to help you drive: obstacle detectors that stop the car when you are distracted and aren't paying attention. Rear view cameras. Self-park features. Those are great if you have them. But really, it's better to turn them off while teaching your teen to drive. Because while they are useful as a backup, you don't want them to rely on these devices. For one thing, your teen must be able to drive without the aids in the case that they borrow or rent a car that doesn't have them. Similarly, we have never "baby-proofed" our house. We've preferred to teach our kids to stay away from outlets, not to play rough at the top of the stairs, and to be smart about where they put their hands around doors, so that they never get their fingers smushed. It takes a bit more effort - but the upside is that if you visit friends who don't have children or childproofing in the house, your kids know what to do and not to do, and you can actually enjoy the visit instead of having to hover over them all the time. Some kids have plenty of confidence. Some could be called cocky. I suspect my CelloPlayer ("Oh! I just had a great idea! - I'm so awesome") will be in that category. I intend to bring that overconfidence down a notch, say by starting early with stops and starts on a hill - pretty demanding in a standard-drive car. Or maybe go over that narrow bridge. And to put stricter boundaries on what is and istn't okay to do while driving. But most kids need you to believe that they can do this. So even as you're sweating over things like the turns ("Slow down! "), or not scraping the parked cars ("Give berth! more berth! "), or starting from the traffic light without stalling in the intersection ("You're fine. Doing great. More gas, and clutch a bit. Ignore the guy behind us"), you must exude the confidence that your child can hack it. Because they need it, just as in the pool they needed your absolute confidence that they will swim and not drown; or that they will roll and not fall when you took away the training wheels of their bike. So as you're sitting on the wrong side of the car, breathe deep. Convince yourself that your child will get the hang of this. Because they will. After all, you did, and your parents gave you their trust. Indeed, after a while I stopped pretending I was relaxed; I stopped hiding the white knuckles of the hand with which I was holding on to the car door. Because the day came that I let go of that door altogether and began to actually relax, and started enjoying the view from the passenger seat. And so it was that one day I gave the keys to my daughter. Watched her get into the car, adjust things (she's taller than I am now), and then pull out of the driveway on her way to a friend's house. A whole new era has dawned.